My thanks to my dear friend and photographer, Yolanda Litton for allowing me to use her beautiful picture of the Provençal countryside. 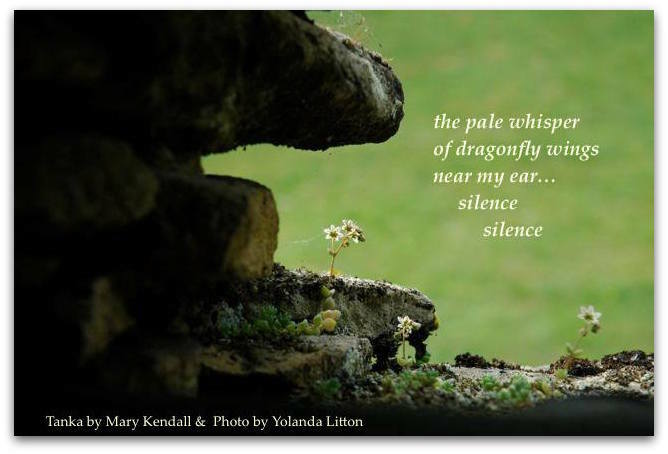 This entry was posted in haiga, haiku, nature poetry, poem, poetry, summer poetry and tagged beauty in nature, dragonfly poem, ephemeral beauty, Mary Kendall poet, peace, silence, summer, transcience of life, whisper. Bookmark the permalink. Nicely worded reality! Helen and I came out of a store yesterday and saw a downed dragon fly which was iridescent green. We had a brief chance for a close up view. Magnificent design and flying ability, silently praising creation. I see them close up quite often. Dragonflies always seem to circle me and hover around me, inviting me to admire their beauty and their remarkable ability to fly so perfectly. They are indeed one of nature’s more surprising and lovely creations. I am honored to have you use my photo with such a lovely poem. It truly captures the moment. Both delicate and lovely, Mary.